So, the Susan Komen Foundation has hired a big-hitter PR firm. And not just any PR firm, either. Now, Komen is assessing the damage, and it’s using a consulting firm founded by two former Democratic strategists. Penn Schoen Berland (PSB), the firm Komen hired to help determine how badly the crisis hurt its reputation, is founded by former Democratic strategists Mark Penn and Doug Schoen. The goal here seems obvious. 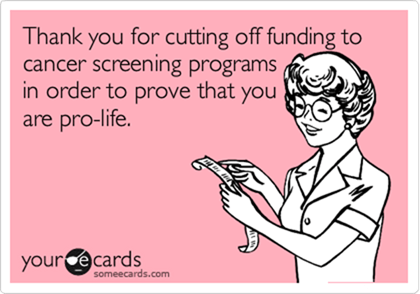 Komen’s recent bout of ballistic podiatry cost it massive amounts of support among people who believe that women’s health shouldn’t be held captive to a reactionary, partisan social conservative agenda. The foundation has accurately understood that this means it needs people from the center and points left in order to thrive. Or, at this point, survive. So they go out and hire … Mark Penn. The Komen Foundation VP at the center of the Planned Parenthood firestorm, Karen Handel, has resigned. A few days ago I predicted on Facebook that she’d be gone within a week, but then retracted the prediction when I learned more about the heavy-Right political leanings of the rest of the board (and the involvement of Ari Fleischer in their strategy development). That headline probably sounds like the dumbest thing anybody ever said, doesn’t it? In truth, though, I mean it as a profound compliment. Let me explain why. Today is LiveStong Day and it’s also Susan Komen Race for the Cure Day here in Denver. Earlier this morning, roughly 50,000 people participated in the Race for the Cure over at Pepsi Center, and annually there are about 130 such races worldwide. For context, here’s the Wiki intro. First, I hope you saw Lex’s tribute to Starchild (given name, Gary Shider), he of P-Funk fame. As Lex notes, Shider experienced problems where the cost of fighting the cancer that killed him was concerned.